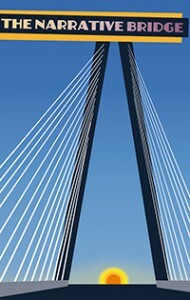 Two days after getting home from California, I drove with my wonderful colleagues to Cleveland, Ohio to take part in the annual meeting of the Association of Medical Illustrators at the Cleveland Clinic. In addition to a stimulating meeting, there was time to explore the splendid Cleveland Museum of Art. 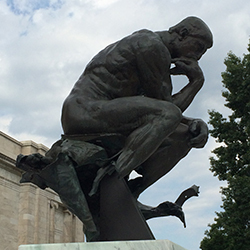 Their cast of Rodin’s The Thinker, damaged by a bomb in 1970, broods eerily over the museum entrance. 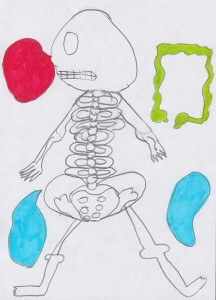 Juliet McMullin and her team organized a superb Comics & Medicine conference in Riverside, California this summer. The Culver Center for the Arts provided an ideal venue: open, airy, and welcoming. Keynote speakers included Carol Tyler, Justin Green, Steven Keewatin Sanderson, and Jared Gardner. 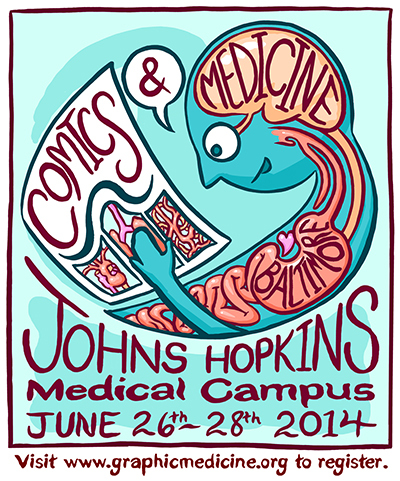 I presented on my evolving research into depictions of eldercare in graphic medicine. 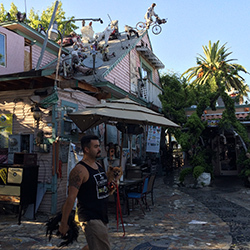 Tio’s Tacos, a restaurant and art park near the venue, gives some sense of what it would be like if Frida Kahlo and Kurt Schwitters made art together then blew it up to ten times life-size. I attended this event and came away inspired. The NYAM events are always a feast for the mind. 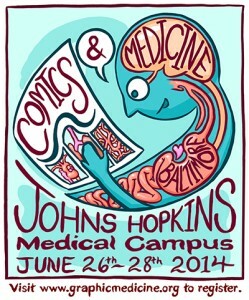 Comics & Medicine: From Private Lives to Public Health (June 26-29, Johns Hopkins, Baltimore) was an amazing conference. The program was exceptional: as always, it was hard to choose between concurrents, with so many exciting presentations and workshops happening at once. Ellen Forney’s final keynote address about her graphic memoir Marbles: Mania, Depression, Michelangelo, and Me was a show-stopper. Lydia Gregg, the superhuman B’more organiser, created this poster along with other fabulous artwork for the event. 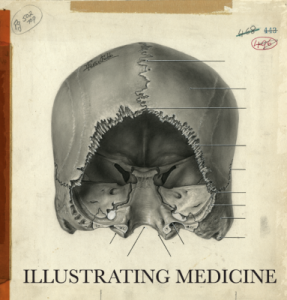 This week I attended the opening of the Illustrating Medicine exhibition at the Loyola campus of Concordia University in Montreal. 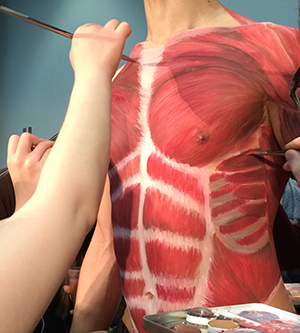 Curated by Kim Sawchuk and Nancy Marrelli, the show features original work done for the first Grant’s Atlas of Anatomy by medical illustrators Dorothy Foster Chubb, Nancy Joy, Marguerite Drummond, and Elizabeth Blackstock. Not only is the artwork superb, but the curation highlights the drawings’ status as material objects marked by their history–the planning, negotiations, revisions, and transport surrounding the creation of a working illustration. The exhibition runs until May 1, 2014. 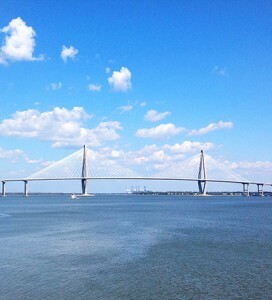 On February 24, 2014, I’ll be giving a workshop at The Narrative Bridge conference at the Medical University of South Carolina, entitled “Drawing (on) Life Experience: Reading and Creating Comics as a Reflective Practice in Medical Education”. I’m looking forward to describing the seminar series I’ve been delivering to students in medicine and other allied health professions at U of T, and to leading participants through some comics-drawing exercises. One of the high points of my trip to the UK was giving a spur-of-the-moment talk to my dear friends’ daughter’s primary school class, entitled “What Does a Medical Illustrator Do?”. Together we assembled a map of the human body, placing organs in their location on a life-sized paper outline (traced from a class volunteer), and talking about what the various organs do. At the end of the day I received a sheaf of hand-drawn thank-you notes, which I will cherish. The conference Ethics Under Cover: Comics, Medicine and Society took place at the beginning of July. It was a superb meeting, as the C&M meetings always are, in my experience: a stimulating, democratic mix of voices, a nourishing meeting of minds. 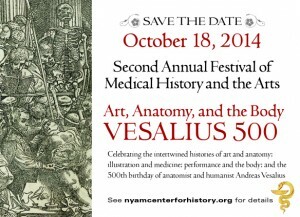 I presented a nascent paper on the role of anatomical illustration and diagnostic imagery within the visual language of comics, focussing on Judith Vanistendael’s When David Lost His Voice; moderated a panel of excellent presentations on comics in patient education; and took part in a concluding panel discussing the ethics of comics in medicine. 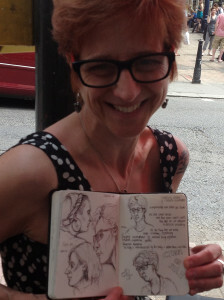 And–best of all–met up with friends in the art & medicine community, including Lucy Lyons, whose drawing of me (and other speakers) I’m holding here, while waiting for a train from Brighton to London. MK Czerwiec is posting the conference presentations, week by week, on the Graphic Medicine podcast.